One conversation. All channels. Engage in relevant, timely conversations informed by a complete customer view. Designed for life sciences and delivered in the cloud, multichannel Veeva CRM empowers your commercial teams with best practices and complete customer insight to transform your customer engagement. 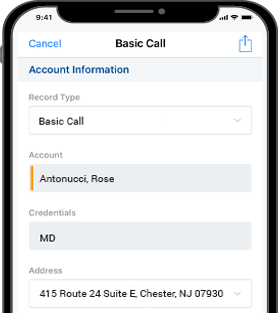 From first outreach and face-to-face meetings to sampling and ongoing education, Veeva multichannel CRM enables you to seamlessly orchestrate your customer interactions to deliver a personalized experience. Grow your business, not your costs: With better targeting and use of digital and personal channels, you optimize your promotional spend while extending your reach. Gain complete visibility: Track your performance and learn what works. With visibility to sales and marketing results, you quantify your success and drive continuous improvement. "We have adopted a holistic, customer-centric strategy by implementing a cloud platform that enables information sharing between sales and marketing. With Veeva as our foundation, we can develop relevant multichannel programs that allow us to engage with customers on their terms." Veeva CRM is the proven solution to deliver end-to-end capabilities across all channels. With mobile innovations that enable access to information from any device, your commercial teams deliver a seamless customer experience anytime, anywhere. Veeva CLM leverages the power of closed loop marketing to transform face-to-face customer engagement. Built into Veeva CRM, it helps field sales and medical science liaisons be more productive, effective and compliant for more meaningful interactions. And with real-time insights into message utilization, sequencing and customer feedback, you’ll learn what resonates. Veeva CRM Approved Email allows customer-facing teams to immediately send compliant content without the risk of traditional email. Extending your reach to low and no-see physicians, Approved Email enables you to deliver relevant information when and how customers want it. Veeva CRM Engage delivers a tailored online customer experience—accessible at any time, through any device. Providing a complete view to web content interaction by each visitor, Engage allows you to improve your relevance while automatically capturing real-time insight into customer behavior and preferences. Veeva CRM Events Management is a single solution to plan and execute all event types across the enterprise. It gives you seamless control and total visibility of all speakers, attendees, activities, and spend for better events with greater compliance. Veeva CRM MyInsights is an innovative visualization capability that provides tailored insights right in Veeva CRM. Life sciences field teams can now get actionable insights at the point of planning and decision to drive better execution.